The Kodak Pixpro SP360 4K is a new action camera which, as the name suggests, can record 360 degree photos and videos. A dome-shaped lens captures an entire 360 degree view, and video can be recorded in 4K quality. 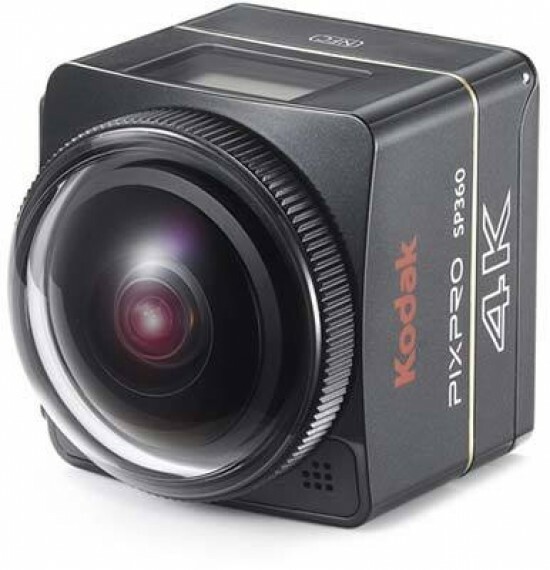 The Kodak Pixpro SP360 4K also features a 12 megapixel sensor, fixed-focus f/2.8 lens, Wi-Fi and NFC connectivity, and is waterproof to a depth of 60m using the supplied housing. The Kodak Pixpro SP360 4K retails for $499 / £349. Virtual reality has long been a buzzword, but has only really come into the realm of the consumer in the past couple of years, via both headsets and cameras that allow us to shoot (and subsequently view) in the round. Yes, what was once the preserve of the Science Museum, or science fiction drama, is now the stuff of the living room. So, whether you view this as of great interest or, like 3D TVs, a bit of a ‘fad’, achieving such footage has arguably never been more accessible, nor affordable. 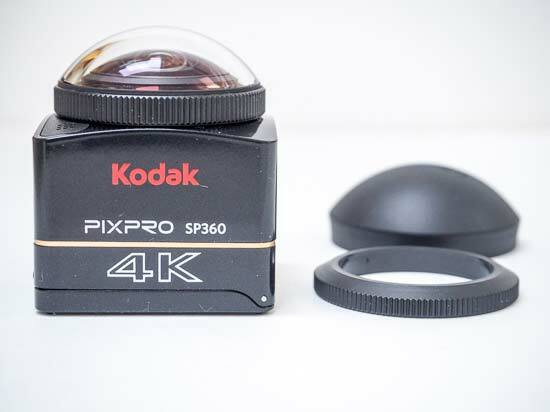 Enter the Kodak Pixpro SP360 4K, which the press blurb suggests has been ‘designed for professionals’. In this case it’s not really referring to those toting heavyweight DSLRs, we believe, but rather estate agents wanting to offer virtual tours of properties, as well as, of course, snowboarders and skateboarders wanting a record of their adrenalin rush. Then there’s the rest of us who might just want one to offer a different visual angle on the everyday; imagine using one deep in the mosh pit of a rock concert. We reviewed the original Full HD video-shooting Kodak SP360 camera back in 2014. Following that, and not unsurprisingly, the second generation now shoots 4K-video or 2028x2028 pixels at up to 50fps. The revamped SP360 4K also offers time-lapse video, support for YouTube 360° video, 10fps burst mode and 4K photo option, as well as the chance to shoot 1280x720 clips at 120fps, all in widely accessible MPEG4 format. Given this is a 4K model, maximum stills resolution is 8 megapixels, in 1:1 aspect ratio. An interesting development, as its Full HD shooting forebear offered a maximum 10-megapixel images. The new model can also be used as a webcam and a loop function (also featured on its forebear) affords the recording of up to an hour of continuous footage at a time, before it loops back and records over the earliest footage, suggesting use as a security camera or dashcam if so desired. We were sent a single unit to look at, though there is also a Dual Pack that adds a second unit at nearly twice the price, should you want to fix two cameras end to end, or back to back. Apart from the full ‘global’ 360° viewing option, much like the first generation unit we’re given a choice of 235° (‘Dome’ effect), 212° (‘Front’), Ring and Segment (180° to the front and 180° to the rear respectively), as well as the self-explanatory panorama. In terms of other photo sizes, unsurprisingly offered in JPEG format solely, there is the option of four megapixel (at 4:3 ratio) or two megapixel snaps (at ‘widescreen’ 16:9 aspect ratio), alongside the default option of the maximum 8 megapixels, being what the camera is set to as you switch it on. As we noted in our original review of the first generation SP360, the small size of the device had us not wanting to change around options too much, as navigating to them and then implementing them is a tad awkward. And once again this 4K version includes precious few instructions out of the box – meaning that downloading a PDF manual before you begin to play is essential. Even then, it’s very much a case of trial and error along with a hefty dose of ‘practice makes perfect’ when it comes to the ‘improved’ version. Which can be equal parts fun and frustration. We were sent the ‘Extreme Pack’ to look at, which features the core camera plus a bundle of additional fixtures and fittings, obviously aimed at those who want to marry their photography with feats of derring-do. Key specification of the unit itself includes a 12.76 megapixel, 1/2.3-inch backside-illuminated CMOS sensor (interesting, as the first iteration utilized a 16 megapixel chip). From it we get 12.40 effective megapixels, spherical imagery captured via a fixed focus f/2.8 lens, with a focus range from 50cm to infinity. Our aforementioned accessory pack includes 12 attachment options: waterproof housing to protect it up to 60m, as well as adhesive suction mount. That said, even the ‘naked’ unit proclaims itself splash proof (yes, subtly different to ‘waterproof’, granted) from the outset. In our personal experience, if on your bicycle, cycling through mud and grime and getting flecks of dirt flying upward as a result, it’s no problem to wipe it clean. Outwardly resembling a lifestyle accessory for a Dalek, not much has changed from the earlier SP360, save for the fact that our review unit came in black (rather than the canary yellow of the first incarnation) which helps its boxy plastic construction look a little cooler, as does an elegant gold stripe running around its middle. On top of this we now have ‘4K’ very proudly emblazoned on one of its four sides. That being said, the singular device is still outwardly a non-ruggedized frill-free cube that may prompt an involuntary ‘is that it?’ as you relieve it from its packaging. Still, it sits comfortably in our palm, or can be conveniently slipped into a pocket, which is when its small size really does come helpfully into its own; the ‘dome’ housing and protecting the lens that sits raised atop it being the only necessary break with the square-edged design aesthetic. 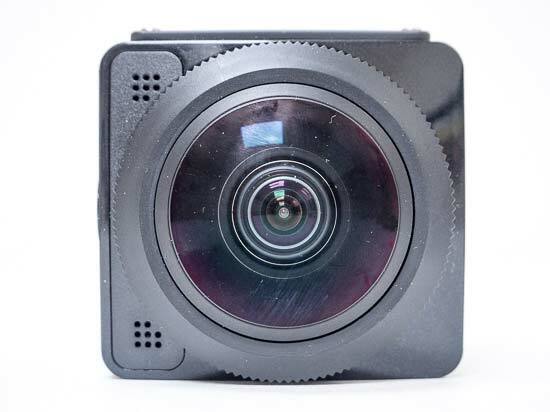 The SP360 4K measures 46.5x50x53mm (its Full HD video recording predecessor was officially 41.1x50x38mm) and weighs just 125g, approximately, with battery and optional removable microSD card the size of your fingernail inserted. Like its predecessor, the ultra-wide angle, resolution hiking ‘full view’ SP360 4K has been put out by Kodak’s current license holder for camera manufacture, JK Imaging, and falls into competition with Nikon’s similarly styled and featured KeyMission 360, which is both newer and slightly more elegant in execution. But in truth these are peas from the same pod (and, potentially, factory). 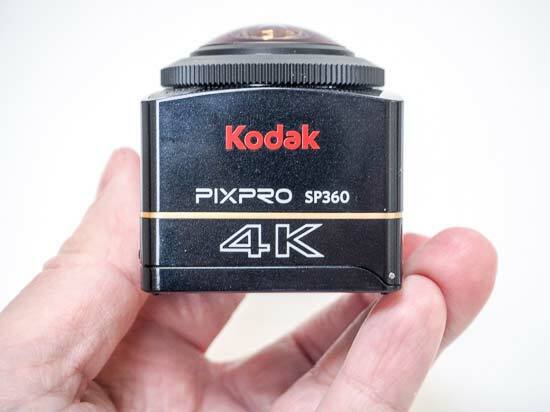 Like rival cameras, the Kodak branded SP360 4K, by its very nature, captures a 360-degree field of view in multiple directions, which means that it can be panned vertically, horizontally, diagonally, or however the user desires, to achieve multiple vantage points on playback. For putting 4K video capture in the round in the hands of the consumer, a current UK asking price starting at a recommended £339 seems reasonable at the outset, with the Extreme Kit priced at £399 arriving in shoebox-sized packaging. Included alongside the action camera itself as standard are: battery charger and AC adapter, USB cable, protective rubber cover/cap for the lens that resembles a squash ball sliced in half, along with a microfibre cleaning cloth (useful, as we found ourselves constantly wiping the lens and body free of smears and clouding), plus Quick Start Guide. The actual SP360 4K camera unit may be small and relatively insubstantial – but the appeal here is more about what one can achieve with it, than camera as lifestyle accessory (or ‘photographic jewelry’) to show off. Indeed, its diminutive size and shape means that it can work equally well as a car dashboard camera, or for use as a security device – another possible application. As one would expect, in terms of connectivity it also comes Wi-Fi and NFC enabled (as was the plain old SP360 mark I) and as with its forebear there’s the ability to download a Pixpro SP360 app for your iOS or Android phone or tablet to connect wirelessly between the action cam and your ‘smart’ device, though, apart from its core settings, functionality remains fairly basic. Light sensitivity runs from ISO100 to ISO800 for example (though this is an automatic feature so cannot be selected either manually or incrementally as on a ‘normal’ digital camera), and as with the first iteration there’s no LCD monitor for lining up our shots; once again it’s a case of point-and-hope, with a one inch LCD window acting as a status display / visual aid to navigating setting options. Exploring the ‘architecture’ of the unit more fully, with the rotund lens occupying the top plate flanked by pin-pricks denoting the inclusion of a stereo microphone, under a soft plastic flap at one side, that requires prizing open by a fingernail, is a narrow compartment housing both micro HDMI interface and USB output port. The USB port and cable can also be deployed for re-charging the battery in-camera, should you hook it up to a laptop or tablet PC. This shared space on one of its four flanks also houses a slot for the removable microSD card. Above this, we also get a screw thread for attaching the device to a tripod or accessory attachment, plus built in ‘buzzer’, or speaker, notifying you of operational choices (we can’t play back video on the device without an LCD screen obviously). The opposite flank of the camera features the narrow 1-inch LCD window, which displays the user’s chosen modes and settings, as basic and icon-led as they are. Think early digital watch in terms of sophistication/straightforward-ness. 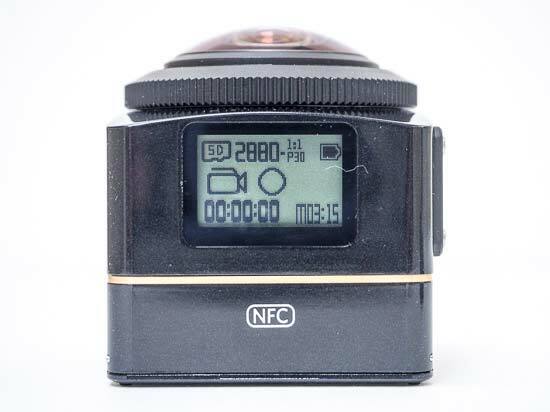 Moving clockwise around the device and the next flank of the camera that we come to is very much its business end, or control panel – the fourth side of the device featuring nothing but logos and branding. The controls here are again fairly basic, with an obvious red record/’OK’ button set in their midst being the most obvious, and most readily accessible. This is the only control that could still be accessed by the photographer/videographer if they were wearing gloves. To its left are two triangular buttons that require precise fingernail presses to operate. The top one is the main power button – for switching the device on and off naturally – which requires that you hold the button down for a couple of seconds before the unit blinks into life with a bleep of affirmation. Once up and running, this also doubles as means of selecting the camera’s operational modes (video or stills, to take the first two examples relayed via the LCD window), with the camera already active. Just below the power button sits the menu/direction button. We found pressing both these buttons a bit fiddly, due to their teeny size, and the fact that they have to be pressed fairly firmly to effect a change. Due to the paucity of controls and generally frill free design and operation, we had to remember which direction to scroll through the menus – represented on-screen one icon at a time – to find what we wanted, and weren’t always successful. We longed for both a better screen and the convenience of a drop down menu, whereby the options might be presented to us simultaneously to pick and choose when we reviewed the SP360 back in 2014 – and, we guess due to keeping down cost still nothing like this has materialized on the SP360 4K. So, as we’ve noted, the LCD/status display window is fairly rudimentary in its complexity or lack of. In video mode for example the screen shows the resolution selected, the fact that removable media has been inserted, battery life, plus number of minutes or seconds remaining. To give this a positive spin, you could argue this keeps things simple (up to a point). Unsurprisingly given the diminutive size of the unit, electronic image stabilisation is deployed here for steadier shooting when it’s rattling around on the handlebars of your bike, rather than any mechanical or optical anti shake option. Operationally, with no viewfinder, electronic or otherwise featuring, it’s a case of point, shoot and hope for the best with the SP-360K. We don’t know what we’re getting until we’ve got back to base, ejected the microSD card and examined our footage. Some may argue that this is all part of the fun, but can lead to some fairly psychedelic and ‘trippy’ captures – particularly if utilising the slow motion video capture option, for one. As we found with the original Kodak SP360, the entire base of the device is taken up by its lithium ion rechargeable battery, which slots into a hollow compartment, with a separate charger and mains cable provided in the box as mentioned at the outset (we’ll forgive the fact that ours was for European sockets rather than UK ones). With battery inserted the unit immediately feels more substantial than its plastic-y outer shell initially suggests. The unit also feels solid held in the palm. Grasp it firmly and there’s no give to the bodywork. So how about bang for our buck in terms of longevity of use from a single charge of its power cell? Capable of use in temperatures down to minus 10°C according to its maker (it was 8°C and windy when we used it), integral battery is good for 160 shots (based on CIPA standards) or 55 minutes of video (4K resolution at 30fps). The unit will also automatically power down if left unattended, to save power. So how did our ‘point and hope’ image capture turn out in practice? Is the SP360 4K an ‘all round’ winner, an all round disaster, or fall somewhere in between the two? Click forward to the next section to find out.